Smell it, hear it, see it, stalk it, catch it, eat it. Our domestic dogs still have some prey drive in them. The act of chasing down a meal and eating it is much more enriching than having a cup of kibble just dumped in a bowl. This makes puzzle toys and feeders a great addition to your pet’s mealtime. Having to work a bit to gain a meal also promotes activity, which our pets often don’t get enough of, and can aid in weight loss. They also help to keep them thinking and learning, which promotes better cognitive health. While you can certainly add a few pungent, extra tasty treats to the puzzles, I suggest you keep those to a minimum as an addition to their regular meal. Simply feed their meals from fun, interactive puzzle toys! The Busy Buddy line offers several food puzzle options for dogs. Each of these puzzles can be adjusted to increase the challenge as your pet gets better at obtaining the food. Most puzzle toys, while durable are not designed to be indestructible or chew proof. Please supervise your pet with the toy and remove it if the pet is causing damage to the toy. A great one to start with for dogs who don’t have much experience with puzzle toys is the Twist ‘n Treat™. The Twist ‘n Treat twists apart allowing for easy loading of food and treats, including dry food, semi moist and moist food. I like to use a smear of yogurt or peanut butter with dry kibble. The toy can be twisted together tighter for longer playtime. 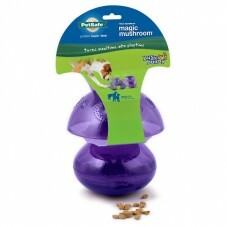 The Kibble Nibble™, the Tug-a-Jug™ and the Magic Mushroom™ all have a large enough capacity for your dog’s entire meal. These are designed to be used with dry kibble and semi-moist treats. 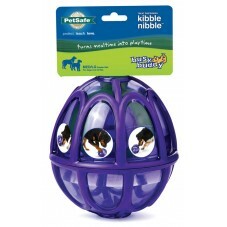 They are designed to keep dogs engaged as they work for their meal and provide extended playtime. As the dog becomes good at getting the food out you can add a golf ball or tennis ball inside the puzzles to make it more challenging. The Kibble Nibble™ is egg shaped and screws apart in the middle for loading. The food dispenses from both ends out of treat meters which can be trimmed to fit the size of food you use. 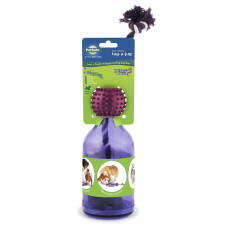 The Tug-a-Jug™ is a bottle shaped toy with a rope inside that the dog must tug to get the treats to dispense. The rope acts both as a stopper and a scoop. If this one is too challenging in the beginning you can remove the rope to make it easier and add it back in later. The unique Magic Mushroom™ has a fun, whimsical design, adjustable treat windows and must be tipped and flipped for the magic to happen. The magic being the access to the tasty treats and food. One more option is the Linkables® puzzle toy set, which actually provides endless options! These three toys can each be used alone or linked together in a variety of combinations for many levels of challenge. With all these options, you are sure to find a fun, enriching puzzle toy for your canine companion. Start with something easy and increase the challenge as learn to solve the puzzle. This will keep them happy and engaged with their new toy!